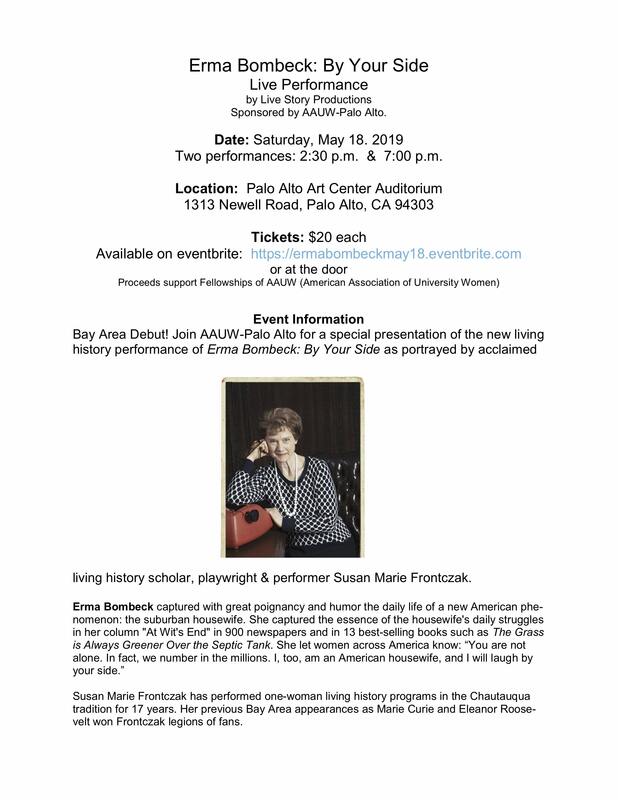 Live Performance by Live Story Productions Sponsored by AAUW-Palo Alto. Two performances: 2:30 p.m. & 7:00 p.m.
Bay Area Debut! Join AAUW-Palo Alto for a special presentation of the new living history performance of Erma Bombeck: By Your Side as portrayed by acclaimed living history scholar, playwright & performer Susan Marie Frontczak. This entry was posted in Branch Events on April 18, 2019 by aauwca76. This entry was posted in Branch Events on September 5, 2018 by aauwca76. September is a time of new beginnings, including the start of the Fall season and the new Branch year. We are hoping that there will be a good turnout of members and prospective members on the morning of September 22 so that we will have a good start to another engaging Branch year! This entry was posted in Branch Events on September 2, 2018 by aauwca76. Please join us for our final general meeting, lunch and program of the 2017-2018 Branch year! What: Lunch, pleasant conversation and an entertaining drama reading by members of the Drama Reading Section. RSVP to Charlotte Jackson so that we may have sufficient food and beverages for all attending. This entry was posted in Branch Events on April 17, 2018 by aauwca76. Join us for a timely discussion about our First Amendment rights with Dean Erwin Chemerinsky, author of Free Speech on Campus and co-chair of the board of the new National Center for Free Speech and Civic Engagement in Washington, D.C. Dean Chemerinsky became the 13th Dean of the School of Law on July 1, 2017, when he joined the faculty as the Jesse H. Choper Distinguished Professor of Law. We would love to have you and members of Beth Am attend this event. Your only responsibility as a Co-Sponsor is to publicize this event and encourage your members to attend. But above all else, please publicize this event to your members and encourage them to participate, even if you choose not to be a Co-Sponsor. Please let us know ASAP and no later than March 9, if you would like to be a co-sponsor so that our final flyer can list your name. 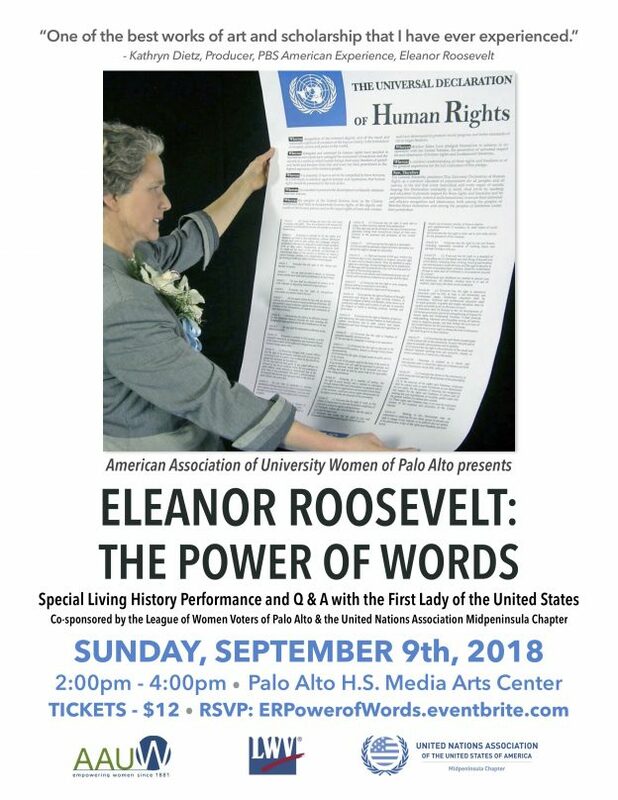 Seating is limited so individuals who would like to attend, please RSVP early at lwvpaoffice@gmail.com or 650-903-0600. Reservations for in-person attendance will be taken no later than March 25. This event is free and open to the public and there is plenty of parking in the lot or on the street. This entry was posted in Co-Sponsor events on March 13, 2018 by aauwca76.